Probably the most memorable image from the film version of George Orwell’s sci-fi novel, 1984, is the scene where John Hurt has a cage containing two live rats strapped to his face. John Hurt plays the book’s leading character Winston Smith, and Smith had been sent for a session in Room 101, the torture chamber where citizens with independent minds were sent to cure them of their ‘insanity’. More recently, Room 101 is the name of a BBC television series where celebrities are invited to nominate things they hate for banishment into it. Examples include over-attentive waiters, TV cookery programmes, Piers Morgan, morris dancing, and the town of Leighton Buzzard. The comedian Stephen Fry once nominated Room 101 itself for Room 101, but my favourite was TV presenter and fellow Everest summiteer Ben Fogle, who quite rightly asked for suitcases with wheels to be put inside. The worst thing in the world? It’s got to be that thing looming up in the mist. 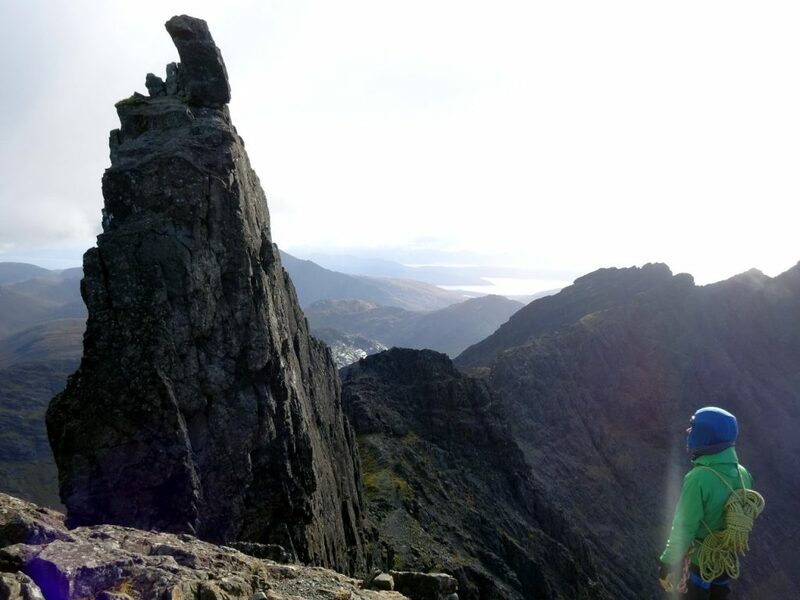 If you asked a group of UK hill walkers to nominate items for Room 101, some of them might suggest the Inaccessible Pinnacle, a narrow shark’s fin of rock that crowns the summit of Sgurr Dearg, a 978m mountain on the Isle of Skye in north-west Scotland. This is because the Inaccessible Pinnacle (or the In Pinn, as it’s affectionately known) reaches up to 986m in height, making it a small but significant eight metres higher than the mountain’s main summit. Were it not for the In Pinn, Sgurr Dearg would be an easy walk up. 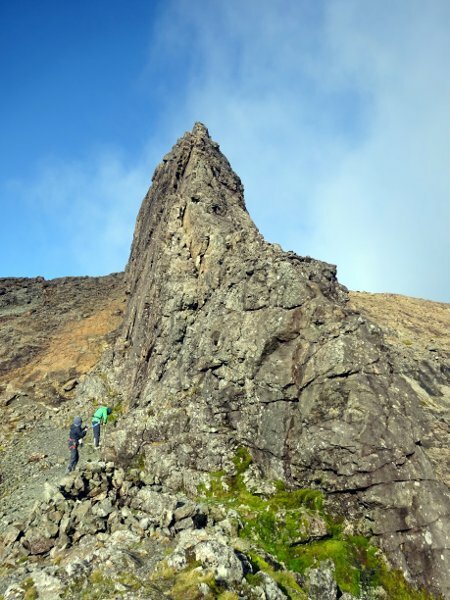 As it is, the Inaccessible Pinnacle is the only one of the 282 Scottish Munros that’s a technical rock climb. This means that at some point in their lives, every Munro bagger is going to have to climb it. Unfortunately, most Munro baggers are simple hill walkers with no more desire to spread-eagle themselves across a rock face than learn how to morris dance. When Sir Hugh Munro created the first list of Scottish mountains over 3,000ft in 1891, he defined 283 Munros (mountains 3,000ft or more in height) and 255 Tops (peaks 3,000ft or more in height but without enough descent and reascent between them and a neighbouring Munro to be considered a separate peak). Strangely, Sir Hugh classified Sgurr Dearg as a Munro and the Inaccessible Pinnacle as a Top. Strangely, because if you stand on top of Sgurr Dearg it’s perfectly obvious that the In Pinn sticks up even higher. A vicar, the Reverend A.E. Robertson is officially credited as being the first man to climb all of the Munros in 1901, but it’s very unlikely that he climbed the In Pinn. 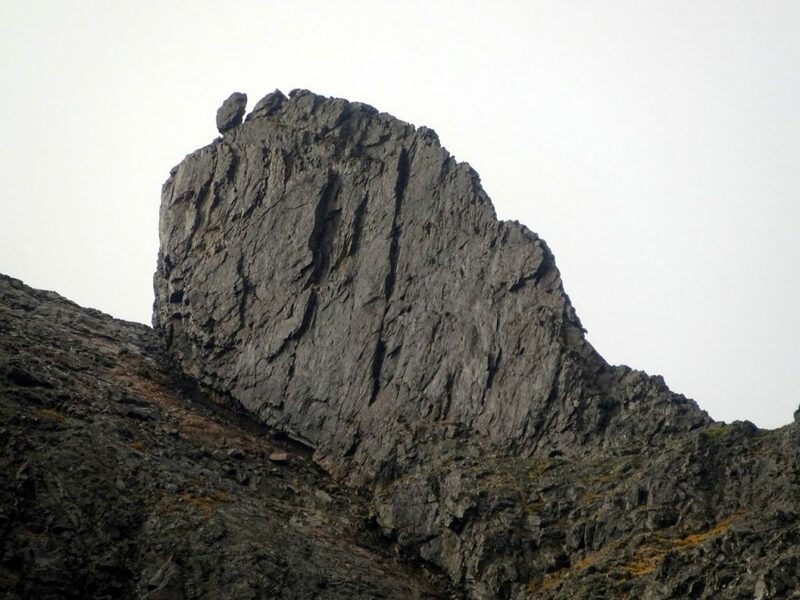 He left no written record of shinning up a hairy protuberance on Skye (or, indeed, climbing a rock tower there), and it wasn’t until the list of Munros was revised in 1921 that Sgurr Dearg and the In Pinn were swapped around so that the latter became a Munro and the former a Top. The first recorded ascent of the In Pinn was by a pair of Lancashire glass-blowers Charles and Lawrence Pilkington in 1880, who had to throw off a lot of loose rock as they climbed. Their ascent was repeated the following year by a local shepherd called John Mackenzie, who had guided the Pilkingtons to the foot of the climb and watched them ascend. Mackenzie made his own ascent without shoes. The first person to complete the Munros properly (i.e. by climbing the In Pinn) was another man of the cloth, the Reverend Ronald Burn in 1923. 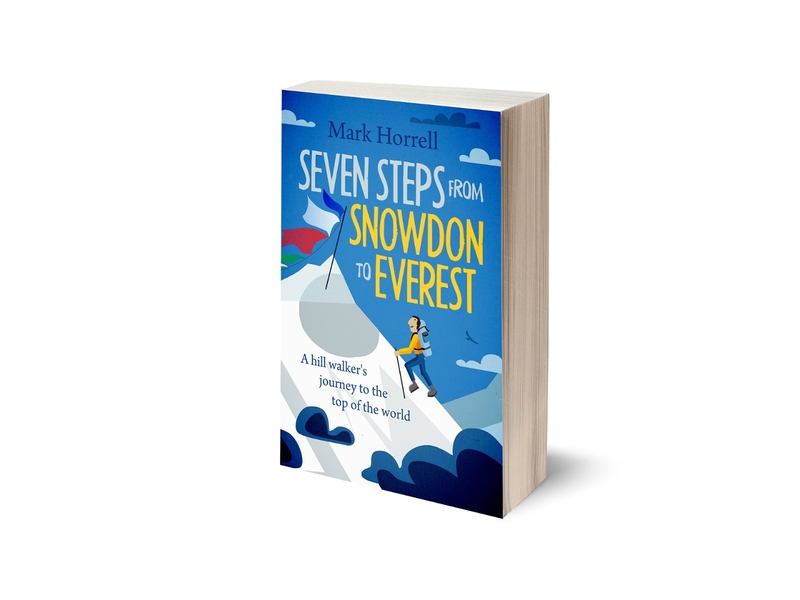 While some people like to set peak-bagging speed records by completing all of the mountains on a particular list in a ludicrously short space of time, such as by a single long, continuous walk, I prefer to take things at a slower pace. 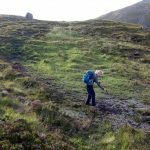 It’s taken me 16 years to rack up four of the world’s Seven Summits, and last month I finally reached three figures in my tally of Munros after more than 20 years of climbing them. Throughout that period (during which many people who started it as a tiny sperm passing along their father’s yogurt hose have now reached adulthood) I have known that at some point I’m going to have to climb the In Pinn. I didn’t consciously aim to make it my 101st Munro, but that was how things transpired. 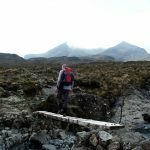 We had five days on Skye, and as I reported in an earlier post, our aim was to climb all eleven of the Munros on the Cuillin ridge. 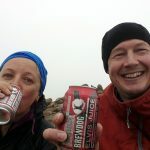 We didn’t expect to succeed – on the Cuillins the weather always has the final say – but we were determined to give it a go. Our guide Andy Hogarth was upbeat about the first day. There were only a few buckets of rain forecast, and the wind speeds were unlikely to exceed 30mph. 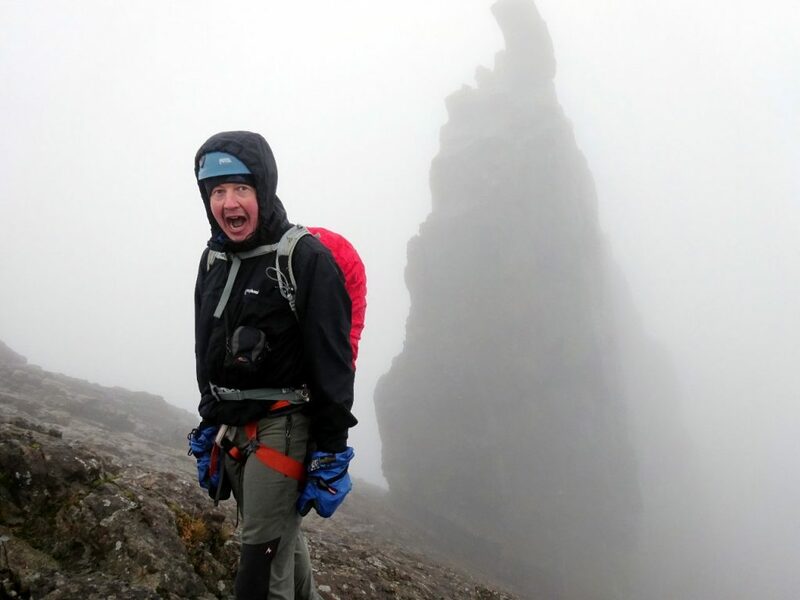 He thought it might be as good a day as any to climb the In Pinn, but we were already wet to the bone as we ascended rain-soaked slabs beneath An Stac, another prominent rock tower on the Cuillin ridge. A ledge appeared on our right and Andy led us up it. We peered upwards and saw a sheer ridge of black rock disappear into the mist. If you’re going to scare yourself shitless by scaling an exposed knife-edge, you might as well have the full experience by doing it on a day when you can see all the way down. That day wasn’t today. No further discussion was needed. It was like a Scotsman opening his wardrobe for a windy day out in the hills, and deciding between a kilt or a pair of rugged Gore-Tex trousers. Andy turned us around and led the way over the summit of Sgurr Dearg. It was the right decision. Over the next few days the weather didn’t get much better, but we bagged a few Munros anyway. All of them involved some tricky scrambling, and we were feeling a lot more confident by the end of the week. ‘Do you fancy the In Pinn tomorrow then?’ said Andy as we came down from the hills on Thursday afternoon. It was indeed. We had a competent guide ready to lead us up, and we were confident in each other’s ability. I’d just climbed my 100th Munro and the Friday forecast was the best of the week. We met at 7.30 the next morning by the mountain hut on the way to Glen Brittle. From there we climbed directly up the west ridge of Sgurr Dearg, the quickest way to the foot of the In Pinn. There was a spot of easy scrambling towards the top, but we didn’t need the rope. We had started early to avoid a potential queue of novice climbers like ourselves struggling up an exposed ridge. The last thing you want when you’re crapping yourself in an awkward position, with miles of fresh air below you, is someone above you crapping themselves even more, and taking an eternity to summon enough courage for the next move. We had made a good decision. There was nobody else around. We had the entire In Pinn to ourselves. ‘This is perfect. I’ve been up the In Pinn around twenty times, and this has only happened a couple of times before. Usually you have to wait,’ said Andy. To make things even better, we could see blue sky, sun, and mountains all around. From the top of Sgurr Dearg, the In Pinn looks like a sheer rock tower, with a precarious boulder balanced on top. This boulder isn’t attached to the rest of the pillar, and looks like it might fall off. It’s known as the Bolster Stone and one day it might, but so far it hasn’t and there was no point in imagining that it might do this time. The stone is big and heavy, and there is a permanent anchor on it that people use to abseil off once they’ve climbed the thing. 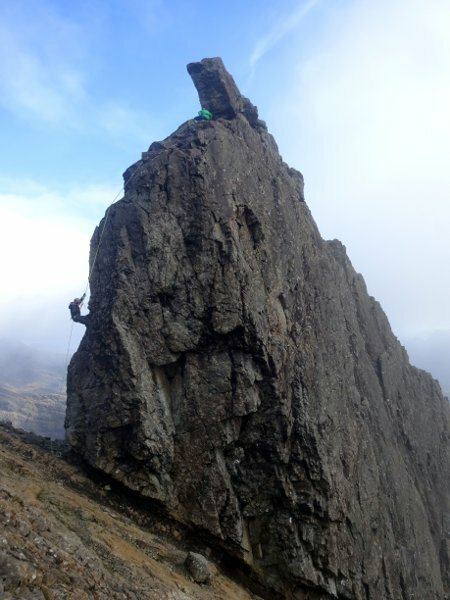 Hilariously, the editors of UKClimbing.com photoshopped the Bolster Stone out of a picture of the In Pinn one April Fool’s Day, and posted an article to say that it had fallen off. 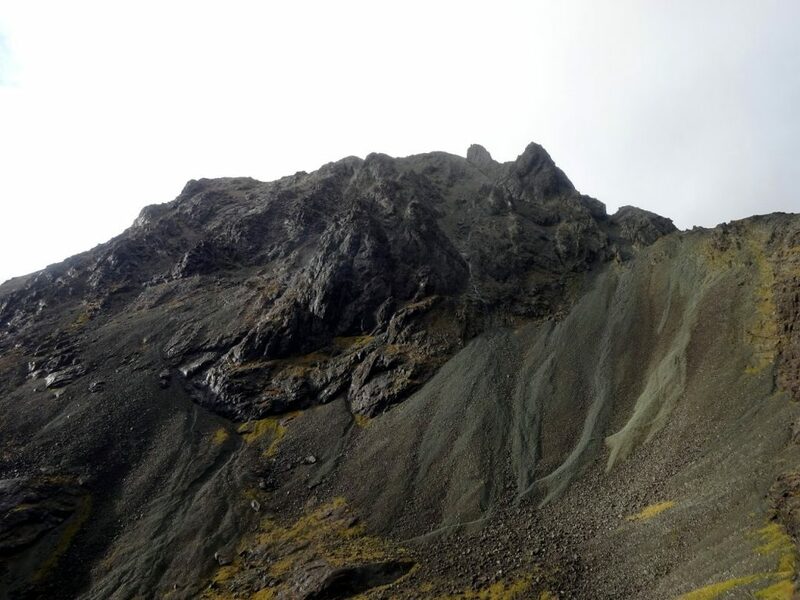 The In Pinn is actually a sliver of rock like a shark’s fin, and if you walk round the other side you can see that the angle of ascent is more gentle, between 60 and 45 degrees, and there are plenty of stable ledges to rest on the way up. This is the east ridge. Its climbing grade is ‘moderate’, which I believe is what rock climbers call a ‘piece of piss’. The main problem with the In Pinn is the exposure. 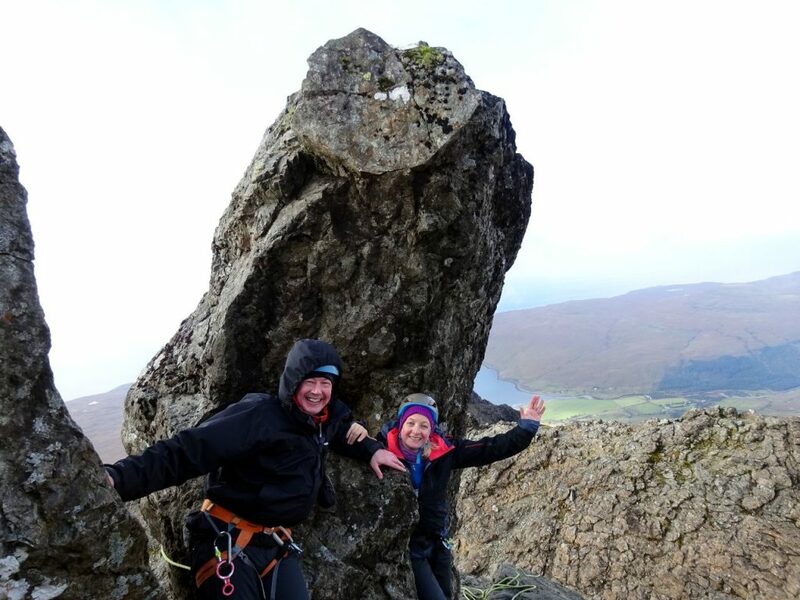 There’s no getting away from the fact that you’re climbing a metre-wide slab of rock, with sheer drops on either side, not just down the In Pinn itself, but the whole mountain of Sgurr Dearg. The trick is to concentrate on the rock in front of you and not look down. All things are relative, and I imagine many hill walkers find the In Pinn pretty hairy. But for me, after 20 years of waiting, it wasn’t all I’d cracked it up to be. That’s not to say it was a disappointment – far from it. I actually quite enjoyed it. For us, it turned out to be quite straightforward. We raced up it and down the other side. By 11.15 all three of us were standing on the summit of Sgurr Dearg having ticked the In Pinn off. 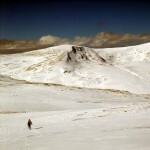 There were 3½ rope pitches from the base to the summit. Andy told us how he first came here as a teenager with all the gear – cams, nuts and slings – trying to be as safe as possible. Now he ascended it in a more lightweight style, free climbing up the first pitch where he set an anchor to belay us up. Edita and I climbed almost simultaneously, she first and me a few metres behind. There was one slightly harder move on the second pitch, where I didn’t feel I had any good hand or footholds, and was relying on friction to get me up. This is a technique known as smearing. It can be disconcerting for a novice, but by then we were confident in the grip of our boots. It didn’t present a problem to either of us. I had a couple of nervy stances while Andy completed the next pitch, once hugging a rock and the second one squatting on a horizontal section of ridge with nothing on either side. I tried to imagine I was using a long-drop toilet, a place where (thank heavens) I’ve never toppled over. The In Pinn flattens out towards the top, and the last pitch and a half was much easier. Soon I was across the top of the pillar and sheltering beneath the Bolster Stone. I guess if you’re feeling really picky then you ought to climb that as well, but I wonder how many people do. Danny MacAskill balanced his bike on top after carrying it up without ropes, but – as I’ve mentioned before in this blog – he’s a nutter. As far as I was concerned, I was standing on top of Munro No. 101, and that was the thing climbed. The 20m west ridge of the In Pinn is more or less vertical and would be much harder to climb. Most people just abseil down it, and that’s what we did too. There was a glow of satisfaction inside me when I detached my figure-of-eight from the rope at the bottom. I could now banish the Inaccessible Pinnacle to Room 101. But I was surprised to discover that I’d quite enjoyed it. I would be happy to climb it again sometime. Yes, I’m sorry. I really should be wearing a mask. Well my experience was completely different! it was windy and wet when myself and a few friends along with our trusty guide got to the summit of Sgurr Dearg. I couldn’t believe what I was seeing was the In Pin since it looked so different from all the photos I’d seen – all I could see was this black needle of a rock in the mist which looked much scarier than the photos I’d seen of it! Even the journey down the wet slabs to the base of the In Pin in that wind was a challenge in itself! I’ve never had any fear issues tackling rocky ridges, scrambling etc before but this was on a different level!! Suffice to say my shins had bruises on them for some time afterwards as I used them to climb the ridge – an unforgettable experience although perversely, I wouldn’t mind trying it again on a sunny dry day so I could “enjoy” the experience more this time – we shall see….